Linda LeGarde Grover knows how to end a story—and manages to achieve both circularity and closure in each and every one. This is an impressive feat in and of itself, but for a collection of linked stories like The Dance Boots, which twist and tie and loop back on one another, the achievement is even more remarkable. Residing within these pages are the members of an Ojibwe community in Missouri, a family in every sense of the word. Everyone who enters these homes is Auntie, Uncle, or Cousin, bound together by a past and present that make a first-degree blood relation entirely beside the point. 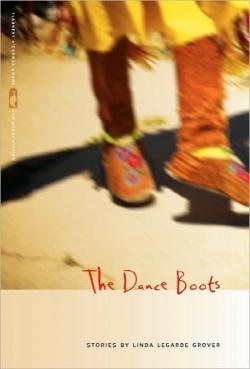 The Dance Boots is Grover’s debut in fiction. However, she has published two other books, one of historical nonfiction and one of poetry, and both her knowledge of Native American history and her poetic turn of phrase are evident in this collection. Grover has done her research, and reading this book is to be in the presence of an authority. Her sense of history is especially notable in the stories of the older Ojibwe, who were taken from their homes to attend government-run boarding schools, where they were beaten and taught more “civilized” ways of living, and where they were forbidden to speak in their native tongue. Grover seamlessly weaves these tales of the past into and around the stories of the present and of the younger generations, the now-adult children who feel obligated to both carry on the traditions and progress in the modern world. Perhaps most importantly, they seek to learn the family stories that have long been kept a secret. In “Shonnud’s Girl,” the narrator says, “Our little girl voices rang high and husky in the stillness of the owners’ absence, the horses’ breaths a lower pitch in the stillness of their waiting.” The book takes on tones exactly like these: the exuberance and impatience of the young, and the quiet waiting of the elders. Steeped in history and its catalytic affects, this collection emphasizes the importance of story, of knowing where you have come from to help you decide where you should go. In “Three Seasons,” Maggie studies the patchwork quilt her mother assembled from the family’s old clothes, a quilt “pieced so large that sleeves and bodices could be clearly seen clutching and elbowing expanses of skirt.” The Dance Boots is like this quilt—a patchwork of overlapping lives, able to both maintain their autonomy and come together to create a unified whole.